That very metaphor slithers through the latest novel by Dominican novelist and singer-songwriter, Rita Indiana, manifesting fully in the English translation of the book’s title – Tentacle. Called La mucama de Omicunlé in the original Spanish, this beguiling but wonderfully thrilling book (translated into English by Achy Obejas) tells the story of Acilde Figueroa, a maid living in post-apocalyptic Santo Domingo, where the oceans run black with pollution and poor people are literally killed on the doorsteps of the wealthy. With the help of a magic sea anemone – and a fulfillment of prophesy – Acilde, who dreams of being male, finds the means to undergo a gender transition. He is then bestowed with the power to travel back in time to save Earth’s oceans. 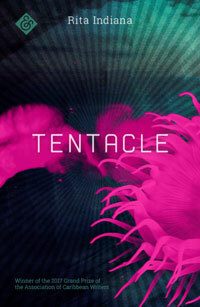 Amy Brady: Let’s start with the book’s title, Tentacle. It represents so many things in this book: the literal tentacles of a rare sea anemone that plays a pivotal role in the story, as well as a metaphor for both monstrosity and connectedness. What was its inspiration? Rita Indiana: The original title (La mucama de Omicunlé) translated into a tongue twister, so my German publisher, and later Achy Obejas, the English translator, proposed Tentatcle as an option, and I loved it. One big wet word, weird and obscene. Amy Brady: Your book is mostly set in a Caribbean of the future, where capitalism, colonialism, and environmental destruction have made life a living hell for everyone save the very, very rich. Tentacle therefore makes clear that global forces like climate change will affect our world’s most vulnerable communities hardest. Do you think about climate change beyond what you write about in your fiction? Rita Indiana: The Caribbean you describe exists in the present. Placing these plagues in the future gives my reader a “safe” place from which to view them. I live in Puerto Rico, the oldest colony in the world, a territory of the United States that was hit in 2017 by a category 5 hurricane, a scale we’ll see more and more due to global warming. During the aftermath, people in the mountains were left to starve and some buried their loved ones in their backyards thanks to a slow and mediocre relief process. Local authorities were more interested in photo ops than organizing real help while [President] Trump made jokes and threw paper towel rolls at people. So, climate change is not just something I think about – it’s already affecting the way my family and me live. Amy Brady: Tentacle also takes us to the past, to the arrival of colonizers in the Caribbean in the 16th century. You seem to connect that century’s demise of indigenous people in the region with more contemporary tragedies like extreme weather events that cause humanitarian crises. Is this an accurate reading? Rita Indiana: Yes! I write about the effects of the past in our day-to-day practices and perceptions, how lives lived by others are part of our psychology and feelings, how we’re repeating patterns dealt to us by colonization and slavery. In Tentacle the 16th-century buccaneers of Hispaniola work as a twin specter of present-day peripheral communities, such as certain art scenes from third-world countries – communities bound by isolation and at the same time dependent upon foreign goods and culture. Amy Brady: There’s also a sense of fluidity in your novel – not just between time periods, but between genders. What inspired you to write Acilde as a transgender character? Amy Brady: Acilde seems desensitized to horrific actions like human extermination and sexual assault. Do you think that humanity in the real world will grow more desensitized to such awful things as climate change continues to wreck havoc on the planet? Rita Indiana: Social inequality is the universal desensitizer. You have people who live in violent environments, who educate themselves in violence, such as a majority in The Dominican Republic, whose survival depends on it. The same goes for those who are being educated in indifference, a passive form of violence. Climate change will make the gap grow wider – crops will suffer, storms will get bigger, affecting especially those with fewer resources. Amy Brady: I read Tentacle in English translation but still got a sense of the variety of languages and dialects your characters use – Spanish, Yoruba, French. I bring this up because I’ve read recent studies about how climate change will eradicate local dialects, perhaps even entire languages, as communities are forced to migrate into ever-smaller land areas. So, in a way, books like yours feel almost like tomes of preservation. Please tell us about your relationship to the languages you write in. Do you see yourself as a preservationist of sorts? Rita Indiana: Yes, I think all writers are. The Dominican Spanish I use to write all my novels in is a language in constant evolution, especially in its street form; new words and idiomatic expressions are invented constantly. I’m overwhelmed by this extreme creativity, which also says a lot about the culture and psychology it springs from. The Yoruba I use in Tentacle is the one used in Afro-Cuban Santería – orally transmitted prayers, songs and myths that arrived in the Caribbean during the slave trade and that for a long time survived in the heads of practitioners. Amy Brady: With news about climate change sounding more dire all the time, are you hopeful for the future? Rita Indiana: I want to be. Tentacle, by Rita Indiana, translated by Achy Obejas, And Other Stories, published January 15, 2019.